Toronto, Ontario, December 17, 2015 ‑ Continental Gold Inc. (TSX:CNL; OTCQX:CGOOF) (“Continental” or the “Company”) is pleased to provide an update on the Feasibility Study (FS) for its 100%-owned Buriticá project located in Antioquia, Colombia. The FS, which is being managed by JDS Energy and Mining Inc., is considerably ahead of schedule and is now anticipated to be released in the second half of Q1 2016 versus prior guidance of late Q2 2016. JDS Energy and Mining Inc. will also be responsible for the mine plan and project construction planning, and M3 Engineering & Technology Corporation will be responsible for the process engineering and infrastructure design work. Notes – Reported tonnage and grade figures have been rounded from raw estimates to reflect the order of accuracy of the estimate. Minor variations may occur during the addition of rounded numbers. There have been no assumptions made as to metal prices or recoveries in this mineral resource estimate other than in gold equivalents that are calculated for GoldEq = Gold + Silver/60. M in Figures and Tables represents millions. Drilling across Yaraguá and Veta Sur was successful in infilling areas and elevation ranges amenable to potential development and mining of both vein systems. As well as confirming master vein continuity at grade-thicknesses similar to or better than in the current mineral resource model, drilling intersected significant mineralization in vein ‘halos” and also intersected some veins not included in the resource model. 4.1 metres @ 11.5 g/t gold and 50 g/t silver, including 1.95 metres @ 20.4 g/t gold and 62 g/t silver (BUUY314D04, VS31, elevation of 1,263 metres). These, and other infill intercepts with substantial grades X thicknesses, extend high-grade sub-domains in Veta Sur vein families (Figure 3) in areas and at elevations that are close to proposed development. 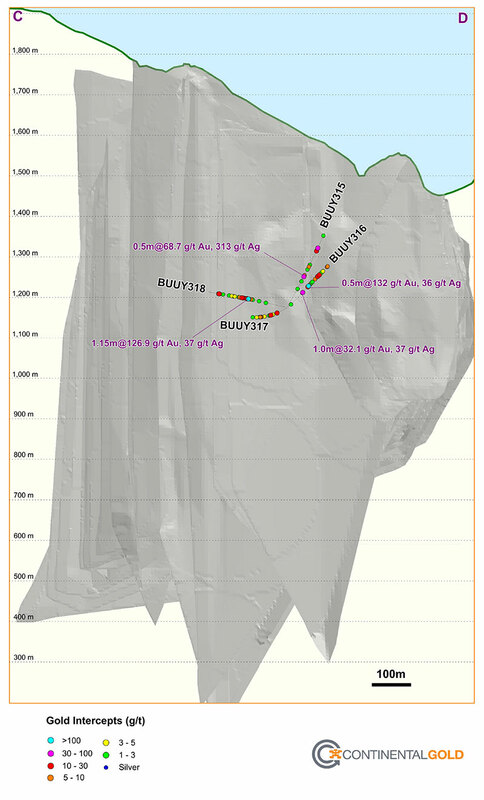 1.05 metres @ 29.5 g/t gold and 28 g/t silver (BUUY318, VNC18, elevation of 1,199 metres). These and other infill intercepts extend higher grade sub-domains in many of the Yaraguá vein families (Figure 5) in areas and at elevations close to proposed developments at Yaraguá. 0.54 metres @ 7.7 g/t gold and 369 g/t silver (BUUY314D01, elevation of 1,136 metres). 0.5 metres @ 6.2 g/t gold and 13 g/t silver (BUUY314D04, elevation of 1,409 metres). 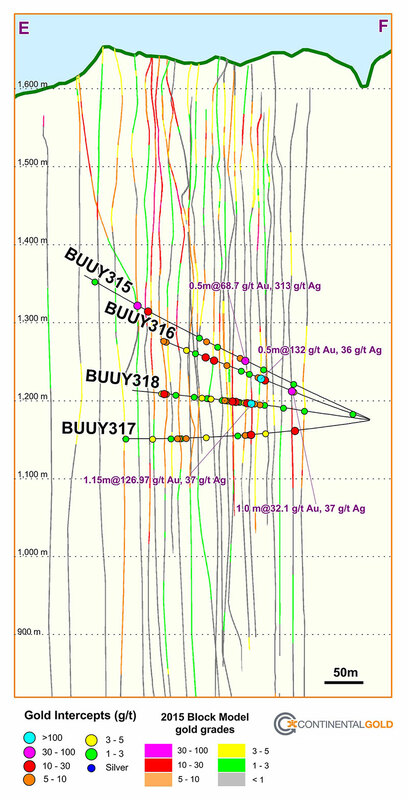 5.25 metres @ 3.6 g/t gold and 5 g/t silver (BUUY318, elevation of 1,201 metres). These and numerous other intercepts confirm and extend the utility of the Company’s (2015) estimation of mineralization on the margins of master veins. These “halo” models will be used to dilute vein resources to minimum potential mining widths and are particularly significant for areas where potential stopes may include mineralized material around one or more master veins. Such material had previously been assigned zero grades. Continental’s 100%-owned, 61,784-hectare project, Buriticá, contains several known areas of high-grade gold and silver mineralization, of base metal carbonate-style (“Stage I”) variably overprinted by texturally and chemically distinctive high-grade (“Stage II”) mineralization. The two most extensively explored of these areas (the Yaraguá and Veta Sur systems) are central to this land package. The Yaraguá system has been drill-outlined along 1,100 metres of strike and 1,700 vertical metres and partially sampled in underground developments. The Veta Sur system has been drill-outlined along 1,000+ metres of strike and 1,800 vertical metres and has been partially sampled in underground developments. Both systems are characterized by multiple, steeply-dipping veins and broader, more disseminated mineralization and both remain open at depth and along strike, at high grades. See “About Continental Gold” below for a précis of the 2015 mineral resource estimate prepared in accordance with Canadian National Instrument 43‑101 (“NI 43-101”). This release documents the results of infill drilling through the Yaraguá and Veta Sur vein systems. Significant new drill intercepts are listed below in Table I and are referenced in Figures 1, 2, 3, 4 and 5. * Intercepts calculated at 1 g/t gold + 50 g/t silver cut-off grades for minimum intervals of 0.5 metres, with up to 30% internal dilution. True widths not accurately known but generally are more than 80% of the down-hole interval for Yaraguá drill-holes and 40-70% for Veta Sur drill-holes. Drill-holes designated “BUUY” were collared from underground, and drill-holes designated “BUSY” were collared at surface. Holes directionally-drilled from “mother holes” (BUUYDxxx or BUSYDxxx) are designated BUUYxxxDxx or BUSYxxxDxx), as the case may be. ** Intercepts in vein domains are respectively nominated by vein code (e.g. VNC) whereas other intercepts are designated as below or outside of the current Buriticá mineral resource envelope. Dilution is defined as mineralization around the margins of modelled vein domains. 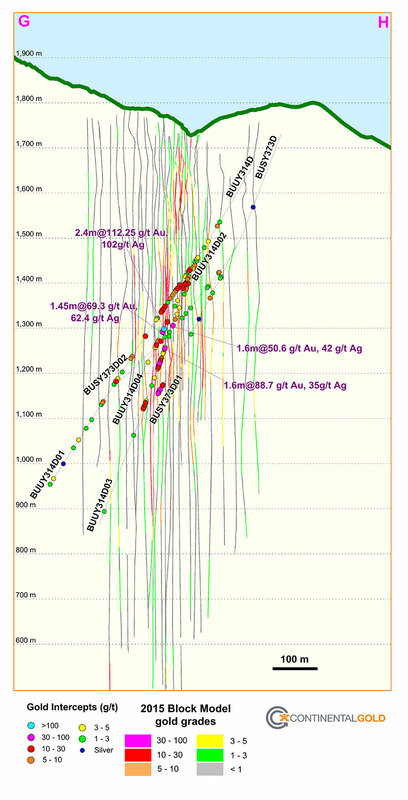 Intercepts with grades X thicknesses apparently substantially greater than for the corresponding vein domains in the current mineral resource block model are also highlighted in bold. Infill and extension drilling of the Veta Sur system comprised two drill-fans, drill-holes respectively targeting west-central and central Veta Sur (Figures 1 and 2). Two drill-holes continued into western Yaraguá (Figure 1). Drill-holes from the Higabra tunnel targeted the central and west-central Yaraguá system (Figures 1 and 4). These, and other infill intercepts with substantial grades X thicknesses, extend high grade sub-domains in Veta Sur vein families (Figure 3) in areas and at elevations that are close to proposed development. Elsewhere, drill intercepts in master veins were generally around the grades X thicknesses expected from the current mineral resource block model for Veta Sur (Figure 3), adding further confidence to this model. These and other infill intercepts extend higher grade sub-domains in many of the Yaraguá vein families (Figure 5) in areas and over elevation ranges (1,100-1,300 metres) that are close to proposed development in Yaraguá. Other drill intercepts in master veins were generally around the grades X thicknesses expected from the current mineral resource block model for Yaraguá (Figure 5), adding further confidence to this model. 0.54 metres @ 7.73 g/t gold and 369.0 g/t silver (BUUY314D01, elevation of 1,136 metres). 5.25 metres @ 3.6 g/t gold and 5 g/t silver (BUUY318, elevation of 1,201 metres, Yaraguá). These and numerous other intercepts confirm and extend the utility of the Company’s (2015) estimation of mineralization on the margins of master veins. Such “halo” models will be used to dilute vein resources to minimum potential mining widths and are particularly significant for areas where potential stopes may include mineralized material around one or more master veins. Such material had previously been assigned zero grades. For additional information on the Buriticá project, please refer to the Company’s NI 43-101 technical report (the “Technical Report”) entitled “Independent Technical Report and Resource Estimate on the Buriticá Gold Project 2015” dated August 7, 2015, with an effective date of May 11, 2015, led by independent consultants Mining Associates Limited. The Technical Report is available on SEDAR at www.sedar.com, on the OTCQX at www.otcmarkets.com and on the Company website at www.continentalgold.com. Continental Gold Inc. is an advanced-stage exploration and development company with an extensive portfolio of 100%-owned gold projects in Colombia. Formed in April 2007, the Company ‑ led by an international management team with a successful track record of discovering and developing large high-grade gold deposits in Latin America ‑ is focused on advancing its high-grade Buriticá gold project to production. On June 24, 2015, the Company announced an updated mineral resource estimate for the Buriticá project, prepared in accordance with NI 43-101, based on 271,003 metres of drilling and sampling (as at May 11, 2015). This estimate covers the Yaraguá and Veta Sur vein systems, with a combined Measured mineral resource of 0.89 million tonnes of mineralized material containing 0.54 million ounces of gold grading 19 g/t gold, 1.58 million ounces of silver grading 55 g/t silver, and 13.4 million pounds of zinc grading 0.7% zinc, and a combined Indicated mineral resource of 12 million tonnes of mineralized material containing 3.94 million ounces of gold grading 10.2 g/t gold, 12.4 million ounces of silver grading 32 g/t silver, and 112.6 million pounds of zinc grading 0.4% zinc. The combined Inferred mineral resource is 15.6 million tonnes of mineralized material containing 4.5 million ounces grading 9.0 g/t gold, 14.7 million ounces of silver grading 29 g/t silver and 91 million pounds of zinc grading 0.3% zinc. 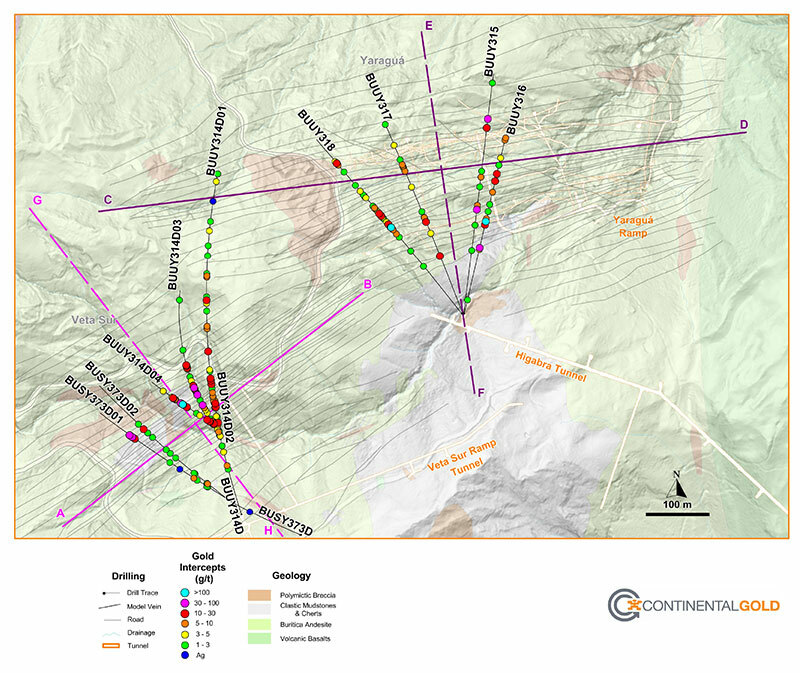 Additional details on the Buriticá project and the rest of Continental’s suite of gold exploration properties are available at www.continentalgold.com. Figure 1 – Plan view of highlights of new drilling in the Veta Sur and Yaraguá systems, showing the surface projection of veins in the current (2015) mineral resource model on geology-topography and underground developments. Lines A-B and C-D respectively refer to the long section lines for Figure 2 and Figure 4. Lines G-H and E-F respectively refer to the cross section lines for Figure 3 and Figure 5. 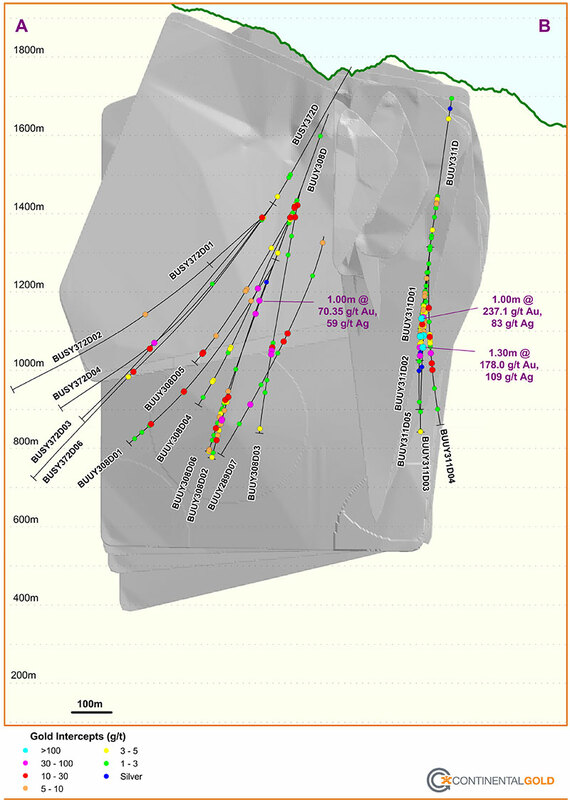 Figure 2 – Long section (Line C-D on Figure 1) showing highlights of new drilling against the 2015 Veta Sur mineral resource envelope. Figure 3 – Cross section (Line G-H on Figure 1) showing highlights of new drilling against the grades of master veins in the 2015 Veta Sur mineral resource envelope. Figure 4 – Long section (Line C-D on Figure 1) showing highlights of new drilling against the 2015 Yaraguá mineral resource envelope. Figure 5 – Cross section (Line E-F on Figure 1) showing highlights of new drilling against the grades of master veins in the 2015 Yaraguá mineral resource envelope.